The Amazing Spider-Man 2 – 4K Ultra HD Blu-ray review | What Hi-Fi? 4K HDR pictures and Atmos sound combine to make an impressive test disc. The Amazing Spider-Man 2 was one of Sony’s first 4K releases and with the Spider-Man: Legacy box set and Spider-Man: Homecoming now available, it seems like a good time to look and see whether this is a UHD is worth having. TASM 2 finds Peter Parker (Andrew Garfield) realising that being Spider-Man comes at a price. Struggling to maintain a balance as Peter and Spider-Man, he's haunted by the promise he made to Captain Stacy (Dennis Leary) to keep his daughter Gwen Stacy (Emma Stone) out of trouble. His life is further complicated by the discovery of his parents’ mysterious past, the return of his old friend in Harry Osborn (Dane DeHaan) and the emergence of Jamie Foxx’s Electro. Can he save New York City and keep Gwen safe from these new threats? TASM 2 is enjoyable enough but suffers from a number of issues. There are too many characters and plot threads for the film to support, the tone is inconsistent and the film feels encumbered by a need to build its own universe rather than focus on the story at hand. It wants to be a crowd-pleaser, but gets caught in a sticky web of its own making. At 142 minutes there’s still a feeling it needs room to breathe, a film stitched together by exposition scenes that appear to take place in one elevator (or store cupboard) of Oscop. Some of the talented cast are wasted (Felicity Jones, BJ Novak) and some never even made the final film (Shailene Woodley’s Mary Jane Watson). That said, the cast are worth watching, especially the chemistry between Garfield and Stone. Foxx is good fun as Dillon/Electro though he’s missing for large parts and DeHaan brings a sinister presence even if his storyline is not the most convincing. There’s also the rush and thrill of the action sequences which are big, brash and over-the-top in a comic-book way. And while the film’s tone is erratic, when it works the film is fun. Some will prefer the first film, but The Amazing Spider-Man 2’s bigger and more ambiitous than its predecessor, though it feels like its flaws are more apparent. Despite that, it’s decent superhero entertainment, but falls below the standard of being a must-watch film. TASM 2 was shot on 35mm film and scanned into 4K, making this a native 4K title. And it looks beautiful. Black levels are very deep and fine detail is increased on the HD Blu-ray with plenty of textures and details more readily noticeable. The decor in Harry’s house seems more opulent, the pallor of Chris Cooper’s Norman Osborn takes on a much sicklier, pale green look and we had previously not noticed the tear that falls down his cheek during that scene. Fine detail is superb. You can count (if you really want to) all the small hexagons that make up (much improved) Spider-Man suit, as well as the texture and details on clothes and faces, whether it’s the amount of stubble on Garfield’s face or the spot above DeHaan’s eyebrow. The 4K disc really does reveal new details. It’s a more colourful, richer and vibrant image too, as the 4K HDR version digs deeper than the Blu-ray. Spider-Man’s suit is made up of deeper and better defined blues and reds (especially with the Oppo 203). The luminescence that surrounds Foxx’s Electro takes on an even more palpable glow and the lighting in scenes seems vastly improved making for an evocative, natural-looking image. A number of early Ultra HD discs had a darker image than the Blu-rays, but this 4K disc retains its bright palette and has a rather nice layer of film grain. Complexions err towards warm, but aren't too out of the ordinary. Visual effects can look soft in places, especially when Paul Giamatti’s Aleksei Systevich makes an appearance in an awful-looking Rhino suit late on. Say what you like about the film but we’ll brook no argument against the image. It’s a richer, more defined, colourful image that looks absolutely sensational. The Dolby Atmos track puts in a sterling performance. The integration of the sound effects and Hans Zimmer’s score is well done, with surround speakers seemingly always engaged, producing an immersive soundtrack. There’s nuance in the audio as well, the smaller, quieter sounds adding density to the soundfield and bringing a scene to life in a very convincing manner. Dialogue is clear and often centred, with occasional forays over to the left or right, producing an engaging to and fro. We also like the distinctive crackly reverb on Electro’s voice that helps accentuate his own presence within the mix. Speaking of Electro, the volume seems to go up a notch whenever he's on screen, with Hans Zimmer’s score sounding expansive and almost overwhelming but still clear and concise. Pharell’s whispering as the voice 'inside Electro’s head' is a little more subtle than we expected and the sound effects and score seem to take on more of a priority. The height channels get a satisfying workout too, whether it’s dialogue or environmental effects, helping to create a wider and taller soundstage. It's an Atmos track that will fill a room, goes loud but also manages to be subtle when required. We really enjoyed the surround sound engagement and precise quality of objects within the mix. It's a fantastic presentation. The film may not be to everyone’s tastes, but you can’t fault the effort that’s gone into delivering top quality picture and sound. It's a bright, colourful looking image and the soundtrack creates a sense of space and immersion in a convincing manner. 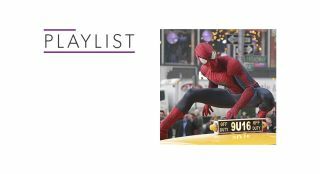 We’ll be looking at how Sony handles the other Spider-Man titles over the next few weeks, because if they’re anything like this, they should be phenomenal adverts for Ultra HD Blu-ray.